Click here to download the full infographic! On December 17, 2014, then-president Barack Obama introduced plans to normalize relations between the United States and Cuba. This long overdue action ended 54 years of diplomatic strain between the two nations. Over the remainder of his presidency, President Obama pursued actions and legislation to further thaw relations with the island country. For example, in 2015, both governments orchestrated a prisoner exchange, Cuba was removed from the U.S. list of state sponsors of terrorism, and embassies were reopened both in Havana and Washington, D.C. Furthermore, the Obama Administration eased trade and travel restrictions, allowing for the first commercial flight in over 50 years to land in Havana in 2016. For American citizens, travel to Cuba is now the easiest it’s been since the beginning of the Cold War. In a symbolic culmination of his administration’s attempts to normalize bilateral relations, Obama traveled to Cuba in March of 2016, making him the first sitting president to visit Cuba since 1928. Finally, in the last days of his administration, Obama ended the controversial “wet foot/dry foot” policy, an important step forward in U.S.-Cuba relations. Click here to see our timeline of changes to U.S.-Cuba policy during the Obama years. Now, a new administration has taken the reins and the future of bilateral relations is unclear. President Donald Trump has simply said that he wishes a “better deal” for the Cuban people, and that the administration is “reviewing Cuba policy.” Unfortunately, neither political insiders nor pundits know what to make of these statements, and the pendulum of relations could swing either way. In this time of uncertainty, it is more important than ever to understand real—not “alternative”—facts regarding public support for possible policy measures. To this end, we have created the Support for Changes in U.S.-Cuba Policy infographic. The infographic is divided into three main sections. The first displays opposition to the travel ban and embargo, specifically from Cuban Americans in Miami. 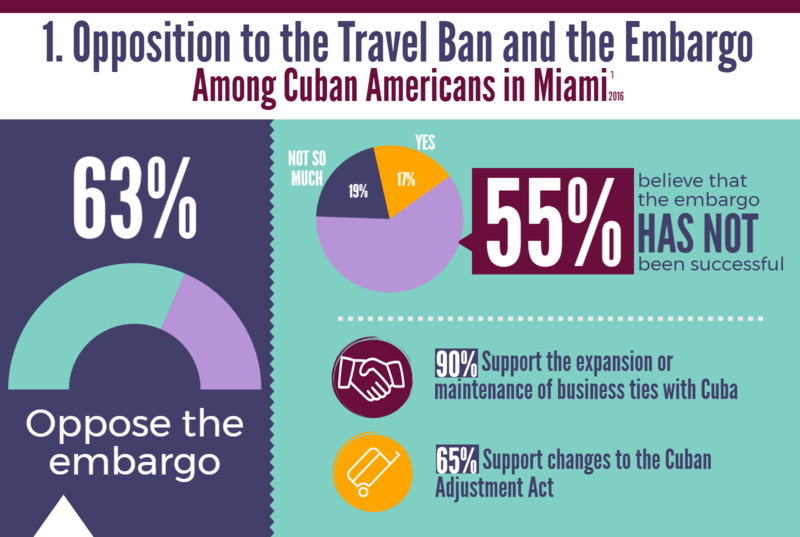 63% of Cuban Americans surveyed said that they oppose the embargo, and an overwhelming majority (91%) said they are in favor of lifting all travel restrictions to the island. The second section, “Obama’s New U.S.-Cuba Policies,” shows opinions surrounding Obama’s Cuba initiatives, most of which have been positive. Finally, section 3, titled “Economic Impact of the Embargo” discusses negative economic effects of the embargo and potential benefits of lifting the blockade. 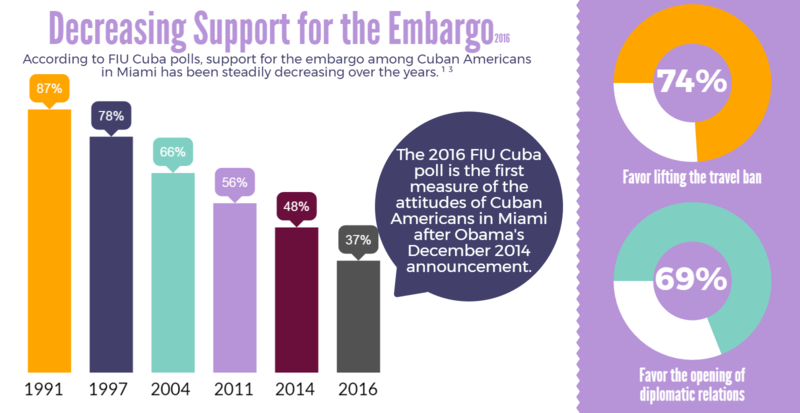 It is evident that a majority of the American public views continued interaction with Cuba favorably. We must encourage our new administration to listen to its people and pursue common-sense policies towards trade, travel, and diplomatic relations with Cuba.